When I first heard the name I wondered what could a fruit look like to justify such a name? Is it shaped like a dragon? Is it large and full of fire with flapping wings ? That’s what I always think about when I hear the word “dragon.” I still love saying the name “dragon fruit.” It makes me feel like I am in a mystical land. Interestingly, it’s a fruit that comes from a cacti plant that only blooms at night. What’s more, it depends on pollination by bats and moths. Not exactly your ideal fruit that dangles from pretty looking trees, like apples that tempted Adam and Eve. 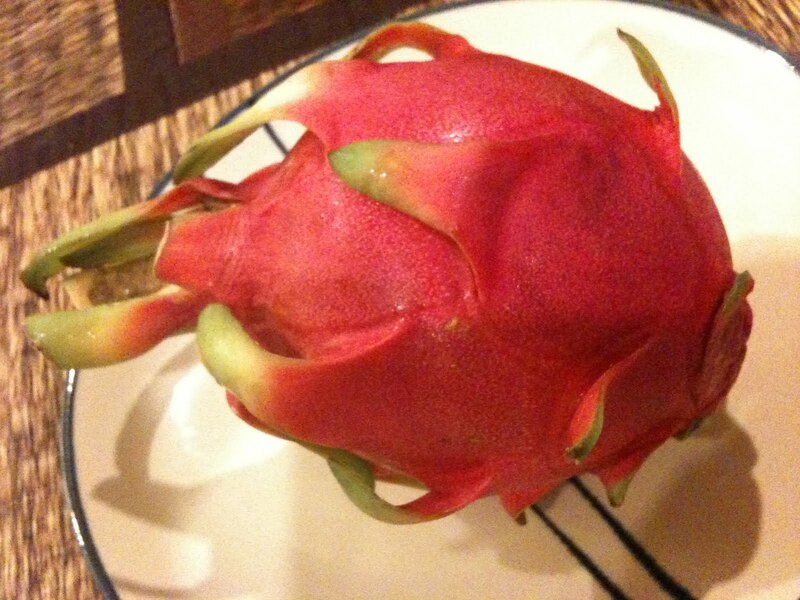 However, after seeing the “dragon fruit”, I can somewhat see why it’s called so. It’s a large light red pearl shaped fruit with hints of green leaves on its sides. It’s ugly and doesn’t look like much of a fruit. Not one that I would willingly try if I were stuck in a desert with nothing to eat. It looks like it could be poisonous, after all poisonous snakes and frogs have bright colours. Upon cutting the fruit, you will find a flesh that can be either white with specks of black seeds or red with black seeds. Fear not, it is safe to eat and can be quite delicious. I have grown to enjoy for it’s juicy, sweet and full of water which is deeply satisfying. I have to admit that not all of them can be sweet and finding the right one can be somewhat of a difficulty, so I always ask the supermarket personnel to choose for me. The ones with the white flesh I find is a bit more crunchy and doesn’t melt in your mouth as much as the ones with the red flesh. However, if you like soft mushy fruits, the red ones might be your style. They also tend to be a bit sweeter. If you are on a diet, I highly recommend this fruit. This was one of my staples when I was going through my weight loss program. It’s filling, it’s healthy and it’s easy to eat. 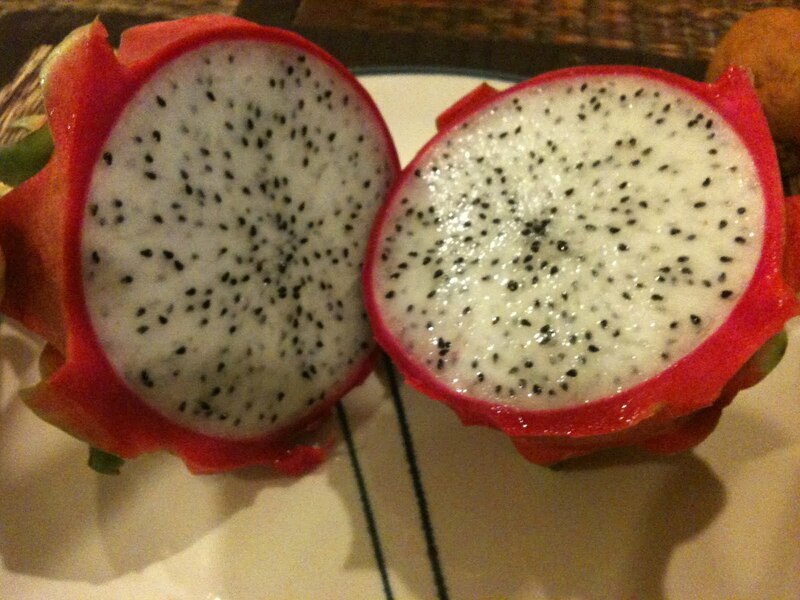 Dragon fruit is filling because it’s high in fiber and minerals. I’ve read that in some countries, diabetics will eat this fruit instead of eating rice. (I have to tell you, one fruit really does fill you up. I sometimes have one or two for dinner depending upon how hungry I am) It’s also a great fruit to have if you have constipation. You’ll find that it works wonders. Nutritional wise, dragon fruit is known to be high in anti-oxidants as well as low in calories. It has calcium, vitamin C and a bunch or other vitamins that are good for you. Basically, it’s healthy. Just don’t eat the skin which can be full of pesticides. How is it easy to eat? Well, if you eat it my way, it’s easy. I basically cut the dragon fruit in half and use a spoon to eat the flesh. I feel like I am scooping ice-cream out of a tub, only that this is dragon fruit and it’s much healthier. (Mind you, I do the same with ripe mangoes.) But you can always peel it and chop it up nicely. So if you want a healthy fruit to eat while on your diet, or want to try something new while in asia. Try having Dragon Fruit. It’s sweet, juicy and somewhat likened to Kiwi for its black seeds, only bigger. Much bigger, Dragon-pearl sized big.